Data for the Mayo Clinic study was obtained from the Rochester Epidemiology Project, a collaboration between Olmsted Medical Center, the Mayo Clinic, the Rochester Family Medicine Clinic, and other medical care providers in southeastern Minnesota. The goal of the Rochester Epidemiology Project is to track comprehensive medical histories for Olmsted County patients, which makes this county a prime location for population-based research. The Mayo Clinic study included 142,377 Olmsted County residents who had office visits between January 1, 2005 and December 31, 2009. The researchers electronically extracted all the disease codes in the records of these patients and categorized the diagnoses into 47 disease groups. 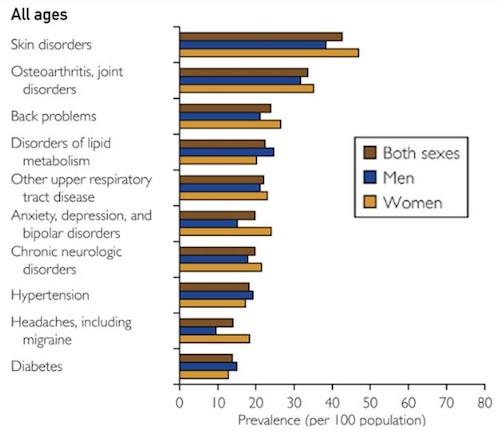 They then identified the top 10 most commonly diagnosed disease groups, which are shown in the graph below ; the bars indicate the percentage of men (blue), women (yellow), and total patients (brown) diagnosed with each condition. In almost all age groups, the top 10 diagnoses were generally more common in women than men; only disorders of lipid metabolism, hypertension, and diabetes were more common in males. The authors write that although the most common diagnoses may not be major drivers of disability or death, they account for considerable healthcare resource utilization, and thus should be a focus of current research. Discovering alternative treatments for these conditions that require fewer office visits will help reduce healthcare costs and lead to improved population health. A big part of healthcare reform is to reduce costs but to improve overall value and quality of life in the people who are affected. To know where to best target your efforts, you have to know what is affecting large proportions of your community. This provides a baseline snapshot of what’s going on in our own community and then as efforts are implement to improve healthcare and healthcare outcomes, we can see if the outcomes within these populations are improving over time. You can watch Dr. Sauver’s comments in the brief video interview below. St. Sauver et al. Why Patients Visit Their Doctors: Assessing the Most Prevalent Conditions in a Defined American Population. Mayo Clinic Proceedings. 2013 Jan;88(1):56-67. doi: 10.1016/j.mayocp.2012.08.020. 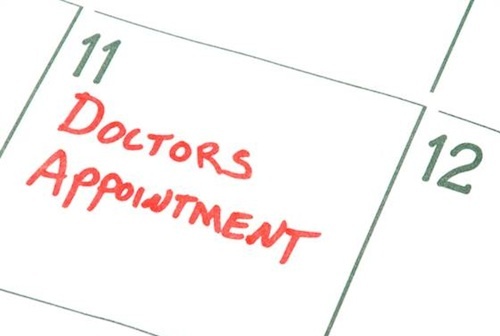 Top List of Reasons People Go To the Doctor. Mayo Clinic News. 2013 Jan 16. Shula Pollard, Ph.D., is an experienced bioengineer in biomaterials and medical device design. She holds a Ph.D. in bioengineering from UCSD, where she designed and tested scaffolds for guided nerve regeneration. Since then she has worked in industry as a medical device product manager and most recently as a medical writer focusing on competitive intelligence, clinical trial data, and continuing medical education. She also teaches Introduction to Medical Devices, an online course offered through UCSD Extension.